For sports fans, the start of a new season has always been a big deal. That puts a lot of pressure on marketers and event organizers to make it a day to remember. Turner Sports—the division of Turner responsible for premium sports content, including NBA on TNT—is no stranger to those pressures. For the 2016 NBA season tip-off, Turner Sports provided basketball fans with innovative, all-access content. In 2017, the live broadcast veteran on linear television decided to expand its tip-off coverage to reach even more fans before the game. 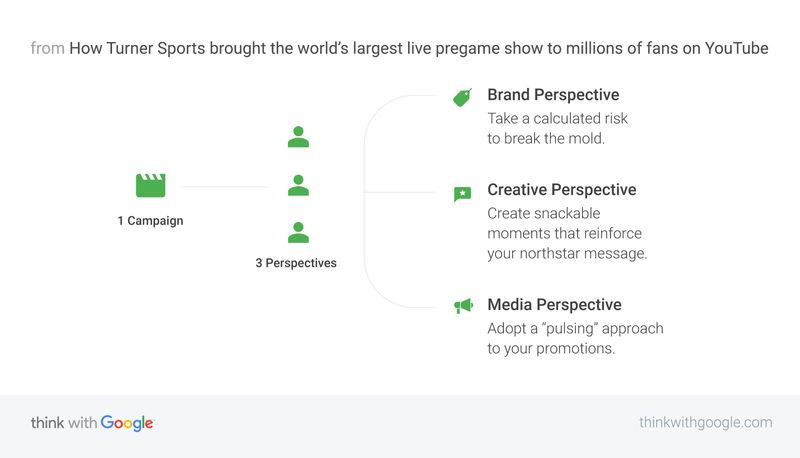 To pull it off, it produced “the world’s largest live pregame show,” which aired for four hours during a 24-hour takeover of YouTube’s most prominent ad placement, the Masthead. The show generated 355 million impressions and has fueled a massive ongoing engagement strategy. We spoke with the team behind the sports advertising campaign to find out how it came to life. “My team and I are 100% focused on engaging sports fans with the content they love. So NBA tip-off is always a seminal moment and a chance to break the mold on how we reach people. This year our northstar message—the one that guided our entire campaign—was ‘An exclusive first look at the return of NBA action and its return to TNT.’ To deliver, we knew we’d have to bring pregame action to fans live, on a massive scale. We felt that the right way to do that was to produce the show online, on a platform where our audiences show up every day. For important events, you have to take a ‘go big or go home’ approach. “Since the live show’s scale was much larger than we’re accustomed to—and since online viewers consume video differently—we changed our creative process in two ways. First, we shifted the run of show to align with user behavior. Engaging fans throughout is always the goal, but we recognized that most people wouldn’t tune in for four hours straight. So we designed the show as a collection of snackable moments, each providing a unique experience or perspective that reinforced our northstar message. “We orchestrated our tip-off media plan across four days, with the aim of driving a lot of excitement in a short timeframe. The campaign centerpiece was the live show, which fell on day two. To optimize for our livestream KPIs—viewership, engagement, and awareness—we pulsed our promotion throughout the day to focus on the moments of the livestream most tied to our goals. Looking for additional inspiration for an upcoming sports marketing campaign? Check out these trends and tips for a scrappy, non-traditional approach.